On high concurrency sites, you need to set a lock on the process (using another transient) so that you don’t have multiple threads hitting the expensive operation before the first one is able to finish. It’s also a good idea to do expensive operations on shutdown, or on a pseudo cron that runs before the transient expires, so a poor user doesn’t get stuck waiting for this operation to finish dynamically. doesn’t the pseudo cron require a user to hit the site? so whatever user trigger the job, gets the performance hit? Good points Mark. Care to elaborate on using a psuedo cron to trigger the operation without the user having to wait? In the context of “normal” cron, this makes sense, but I’m not entirely sure what you mean by “psuedo cron”. 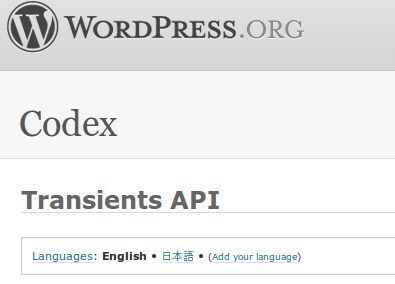 By pseudo cron, I mean WP Cron, WordPress’ built-in pseudo cron implementation. When populating the transient for X minutes, you’d schedule a “force rebuild” of the transient to happen at X-5 minutes (assuming it’s something cached for long enough to allow this much room). Coincidence I found this on reddit and I happen to have the same questions regarding Mark Jaquith’s comment, I was going to ask this a few days ago on wordpress.stackexchange because even though using the transients is simple there is a real lack of documentation on how it works, especially with regards to locking, garbage collecting, and running it off a cron. The Cron issue can make really good for easing your server load, but the use transients, even without a cron for the expensive operation, is a must do. With transients one user has to wait for the operation to finish, without then every user have to wait. Concurrency problems may happen in high load sites, but for the 99% of blogs i would not worry about them. Couldn’t agree more. I wish I had to worry about concurrency problems. I envy the folks who get to work on those types of problems.